This extensive teaching and learning collection features classroom resources targetting narrative writing skills. The main purpose of a narrative text is to tell a story which entertains the reader or listener. Narratives may also be used to teach or inform. This collection includes educational posters, teaching presentation PowerPoints, student worksheets, learning activities and more. A 14 slide editable PowerPoint template to use when teaching younger students about how to build a character for a narrative text. Students use a template to help them write stories with alternative pathways for their friends to read. A 19 slide teaching presentation containing visual narrative writing prompts. A set of 3 dice to use when to generating ideas for creative writing. A plot diagram for students to refer to when planning their narrative writing. This English unit addresses the narrative text type, specifically, how to plan and write an engaging story. This English unit uses fairy tales to introduce the narrative text type to younger students. It addresses the structure, characters and language features of a narrative. This English unit addresses the narrative text type; specifically, how to write an engaging narrative text. Tips and tricks to use when teaching narrative writing in the classroom. Exploring book characters with your students is a crucial element of understanding the narrative text type! 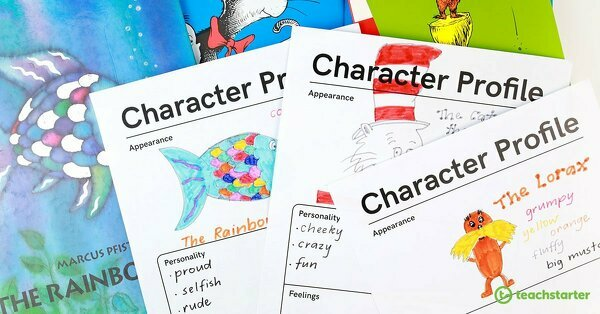 Here are some of our favourite stories, activities and teaching resources about book characters. Check out this simple and effective classroom display idea! Create a customised "Help Centre" for any unit you are working on with your students.